These are some of my very favorite books, and authors. I chose to list science fiction novels rather than books because most of the time, I tend to read novels rather than short stories. I like to be engrossed in a novel, and enjoy working my way through a complex story I can read over several (or many more than several) sittings. 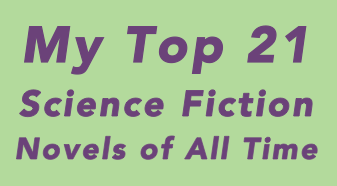 In the case of many of the entries on this list, these are not just my favorite SF novels, they are my favorite authors. I tend to find authors whose work “speaks to me” and then read many or even in some cases all of their published works. For these authors, the novel I chose to represent him or her on this list is the book by that writer I might recommend as “representative” or as the best first book to read if you have never read that writer before. Over the years, a number of friends and students who were interested in reading science fiction (and for whatever reason thought I might have a good sense about it?) have asked me to recommend books to them. So here we are. For the most part, books I have read more than once. For the most part, authors by whom I have read many or most of their works. Readers of this list are more likely to find examples of the kind of science fiction books I like to read, rather than a selection of excellent examples that collectively represent the best the field has to offer. For a list like this, visit BestScienceFictionBooks.com or NPR’s list of Top 100 Science-Fiction, Fantasy Books. Science fiction that considers mostly the themes above is often referred to as “soft” SF, as opposed to “hard” SF (which tends to dwell more on technology), although not in every case by any means. Generally speaking this delineation within the genre references the same distinction among the sciences (natural sciences being the hard sciences and social sciences being soft) but there is some thought that the very best SF incorporates both. An interesting discussion of this can be found here. I have not included Fantasy novels – which I consider a separate genre – on this list. That said, there is without doubt some crossover and influence between the genres, and some of the authors on this list have contributed to both. SF is sometimes called speculative fiction – stories that ask “what if?” – and I like the term. Its been around a long time, and although it has never really caught on for general usage, speculative fiction is perhaps more accurate than science fiction as a description of the genre of books on this list – some of which might surprise you. The order of the list is roughly based on the chronological order in which I encountered the authors – it is not a force ranking! The position of any book/author on this list has no bearing on how excellent I consider it in comparison to other books/authors on the list. In fact, many of my very favorite novels – the ones I have read many times and that have made the strongest impact on me – are in the middle or towards the end of the list.